If you love playing golf (or just prefer the online version, like me), then you’ll enjoy the variety of golf courses available to you right here at your computer. Choose from regular 18-hole golf courses or try your hand at some putt-putt miniature golf courses complete with slopes, obstacles and everything you’d expect to find at a “real” course. Plus, for kids of all ages, and golfers of all skill levels, you’ll find everything from the super simple to courses with challenging obstacles. So, if you can’t make it to the golf course today, try one of these. Cure your craving for a round of golf with these 18-hole online golf games. Driving Range — try your hand at some long shots… complete with laughter, booing, hissing, and applause. For the record, I mostly got laughed at! Pin High Country Club Desert Golf — somewhat realistic with chirping birds, water, sand, and other “actual” obstacles. Ryder Cup Challenge — some say it’s the closest thing to actually playing golf. Blasters — a kids golf game from Sports Illustrated for Kids (SIKIDS). Golf Challenge — 18 tricky holes of purely perilous putting. 3D Golf — it tracks your personal stats and has a scoreboard. 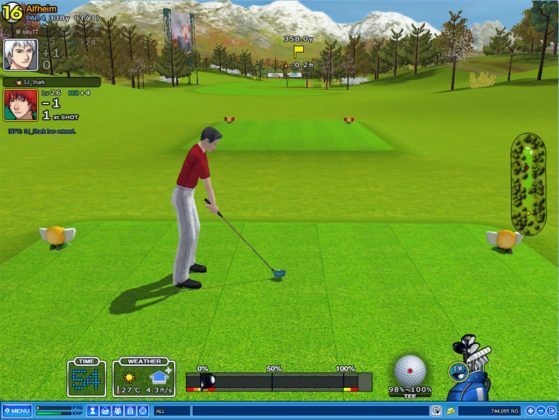 If putt-putt is more your style, then you’ll enjoy these miniature golf games online. Carpet Golf 3D — click on the field in the direction you want to swing and an aiming arrow will appear (the size of the arrow indicates the force). Press SWING to initiate the shot, then release the SWING button when the red aim indicator is at the center of its range. Lookout Now Mini Golf Game — use your mouse to line up your putter (blue means you’re right on target and the spacebar indicates the strength of your stroke). Try to get the ball in the hole with as few strokes as possible to score high! The tamest of them all… try your hand at the golf solitaire — an online golf game with a deck of cards! Then you’ll definitely want to try your hand at playing this World Golf game online. It’s one of the most realistic golf games you can find! This one is Jim’s favorite.